A terrarium is basically a miniature garden in a bottle. There are 2 main types of terrariums: Close and open. A close terrarium is entirely sealed up with no openings at all. The water cycle and gaseous exchange takes place within the bottle itself. As such there is no need to water and maintain the terrarium oftenly. There are only 2 things to note pertaining to its maintenance process: Watering and airing. Unlike close terrariums, open terrariums have an opening that allows for gaseous exchange within the interiors of a terrarium and its external environment. However, because fittonias do grow, they will do so and grow around the inner glass walls of the terrarium bottle. 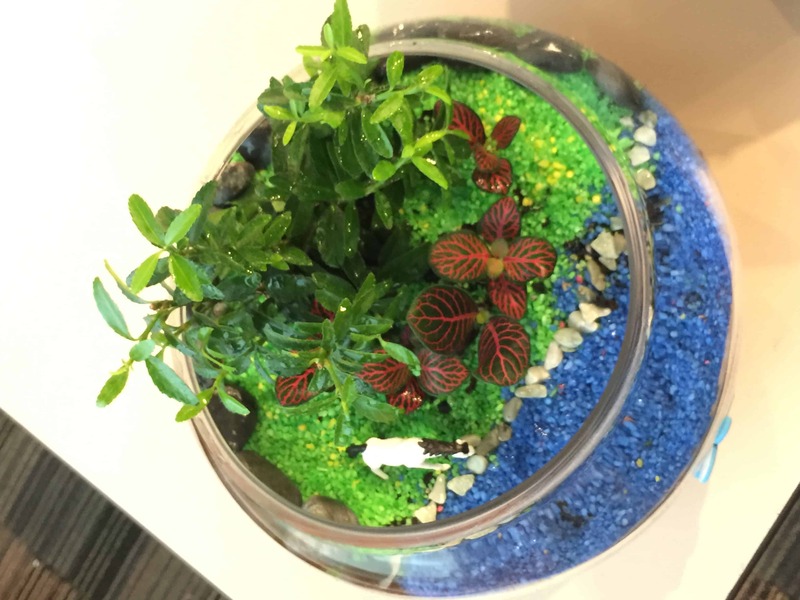 This may lead to overcrowding within the terrarium confines and for owners who are concerned about its aesthetics, you might want to convert your close terrarium into an open one. Note: Although you could prune your fittonias, we do not recommend it unless you have a fair bit of experience in doing so. Reason being that fittonias are very delicate plants. Pruning done wrongly could result in its death. Simply leave the cap open. While doing so ensure to keep your terrarium away from the sun as fittonias are very sensitive to direct sunlight. Also leave your terrarium area from hotspots. Typical hotspots are, the kitchen and your computer CPU. Do note that open terrariums require much more maintenance than close terrariums. Note that with an open terrarium, you have to water your fittonias more often as it is constantly being aired to the environment – i.e. water content is lost to the surroundings and has to be constantly replenished. We recommend leaving it open for 2-4 days. After which, give it 4-7 spoonfuls of water depending on the size of your terrarium glass bottle. Why do open terrariums require more maintenance than close terrariums?